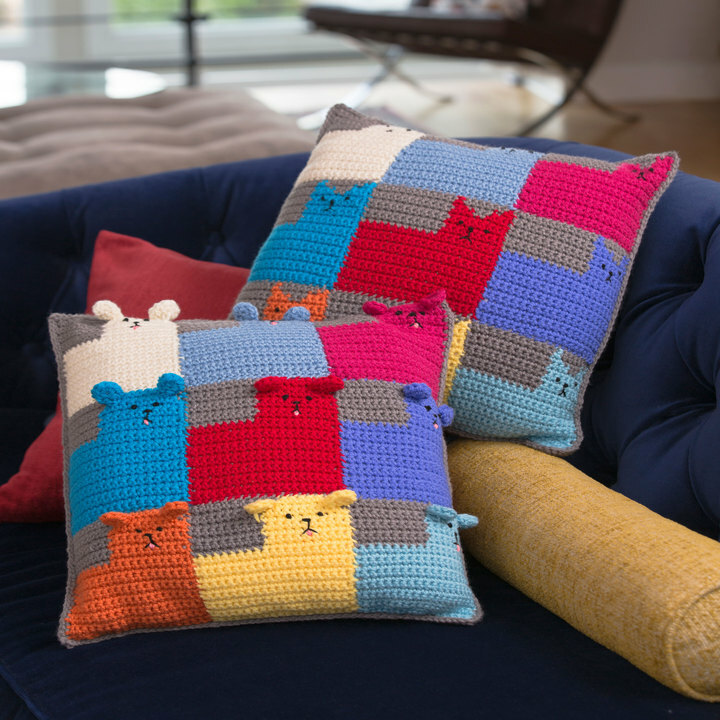 Here’s a fun blanket for those who love filet crochet and those who would like to try it. 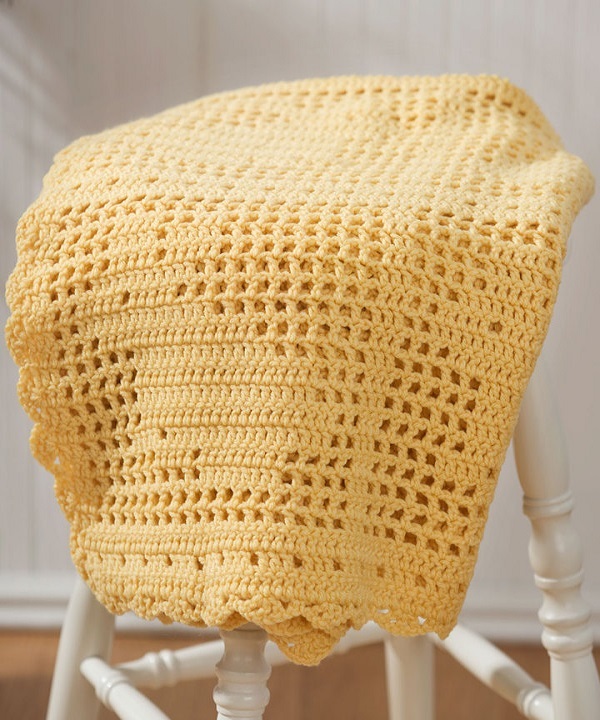 It’s perfect for a baby or toddler and for guests that visit in the springtime. 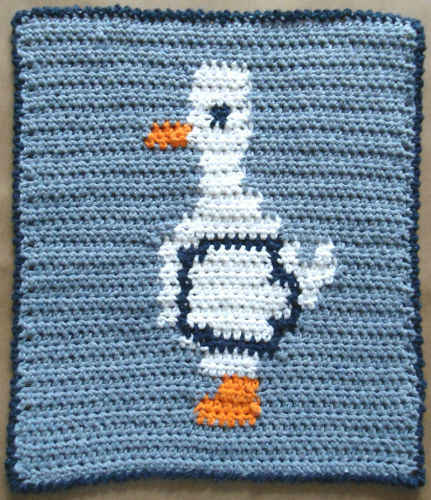 GAUGE: 12 sts = 4″; 7 rows = 4″ in pattern. CHECK YOUR GAUGE. Use any size hook to obtain the gauge. Afghan measures approximately 48″ x 51″. Block = dc in next 2 dc OR dc in next dc, dc in next ch-1 sp. Space = dc in next dc, ch 1, skip next dc OR dc in next dc, ch 1, skip next ch-1 sp. Row 1 (Right Side): Dc in 4th ch from hook and in each ch across; turn – 147 sts. Row 2: Ch 3, skip first dc, dc in next dc – beg block made; * 1 space, 1 block; rep from * to last st; dc in top of ch-3; turn – 36 spaces and 37 blocks. Row 3: Beg block, * block; rep from * to last st; dc in top of ch-3; turn – 73 blocks. Row 4: Beg block, * 17 spaces, 1 block; rep from * to last st; dc in top of ch-3; turn. Rows 5-87: Follow chart. Fasten off. Edging: With right side facing, attach yarn in upper right corner; ch 1, sc in corner st, * ch 1, skip next 2 sts, ([dc, ch 1] twice, dc) all in next st, ch 1, skip next 2 sts, sc in next st; rep from * to corner, placing last sc in corner st; ** working along side of afghan ch 1, skip first row, shell in middle of end st of next row, ch 1, skip next row ***, sc in top of st at end of next row; rep from ** to next corner placing last sc in corner st; rep from * once more, end at ***; join with a sl st in first sc. Fasten off. Weave in ends. 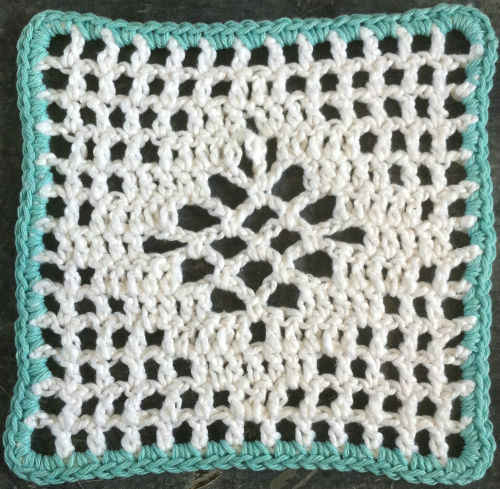 ch = chain; dc = double crochet; mm = millimeters; rep = repeat; sc = single crochet; sl = slip; sp = space; st(s) = stitch (es); * or ** or *** = repeat whatever follows the * or ** or *** as indicated;  = work directions in brackets the number of times specified.